With increasing population in the parishes in Brockport, Hilton and Kendall, St. Elizabeth Ann Seton parish in Hamlin, NY was established by Bishop Mathew H. Clark on February 10, 1982 with Father William Amann as Pastor. In the spring of 1982, Sister Mary Kay Ryan, SSJ, joined the parish staff. Deacon Robert Solan served the parish until November 1983 Then in December 1984, Deacon Ramon Datz joined the staff, and Deacon John Holmes joined in June, 1991. Our first Mass was celebrated in Pogroszewski's barn on Lawrence Road on Ash Wednesday in 1982. We moved to the RR "Depot Church" and celebrated our first Mass there on the Vigil of Easter. Soon after, the parish rented the old church building (Rts 18 & 19) as an Education, Parish & Teen Center, and also opened a community food/clothing center in the Glogowski store front on Lake Road. 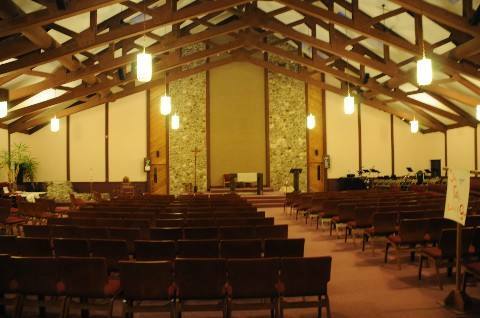 An addition to the depot church was built for Christmas 1982, increasing the capacity to 250. A 100 year-old farmhouse was the first rectory. In 1983, a home on Lake Road was purchased and still servers as the SEAS rectory. 1983 saw the establishment of the first full Pastoral Council, and the 15 acres of land were purchased at the present church site. In 1985, parishioners discerned requirements, designed a worship and meeting facility and launched a fund drive. Ground was broken by Bishop Clark on May 6, 1986. Construction began in June, 1987. The first Mass was celebrated at the present church site in September of 1987 in a rainstorm on the occasion of "The Rock Party," when more than 20 parishioners brought 200+ tons of stone from the fields. Our sanctuary wall of family stones became the symbol of the family spirit that characterizes our parish. The 1987 Christmas Eve Mass was celebrated in the unfinished building, and construction continued with the added sweat equity of parishioners and others. The church was blessed by Bishop Clark on October 14, 1989 and was solemnly dedicated on August 9, 1992, with 853 families registered. The Eucharist Chapel, also used for daily Mass, was completed in 1992, and a full immersion baptismal font was fashioned of stones brought by parishioners in time for the Easter Vigil Service in 1996. Plaques made of mahogany depicting the Holy Family and our patroness, St. Elizabeth Ann Seton, now grace the church walls. We continue to finish and furnish our building with time, talent and treasure as we continue to minister in word, worship and witness, the presence of Christ in this area.